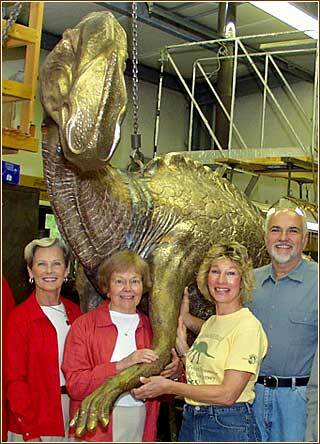 LAMBERTVILLE, N.J. -- Hours after the final cast section -- the head -- was welded onto the Hadrosaurus foulkii sculpture in the Stewart Sculpture Casting foundry here, a contingent of HATCH Committee members joined sculptor John Giannotti to inspect the work in its final phase. Weld lines were still showing and surface finishing is still to be done but the project is exactly on schedule for its installation and dedication on Oct. 18 in Lantern Lane. From left to right: Haddonfield mayor, Tish Colombi; HATCH Committee co-chairs, Jan Twitchell and Beverly Aldeghi; and artist John Giannotti. 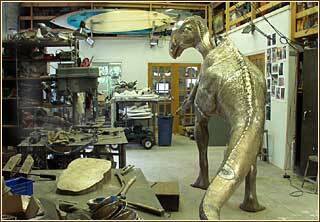 The sculpture's final dimensions are 8 feet, 3 inches high by 14 feet, 6 inches long. It now takes up a good portion of the main building of Stewart Sculpture Casting. When its final surface work is completed, the sculpture will be secured on a flatbed truck and transported to the Lantern Lane to be hoisted into place by a large crane. The surfboards at the front of the metal shop belong to Dana Stewart, sculptor and foundry owner who is also an avid surfer.